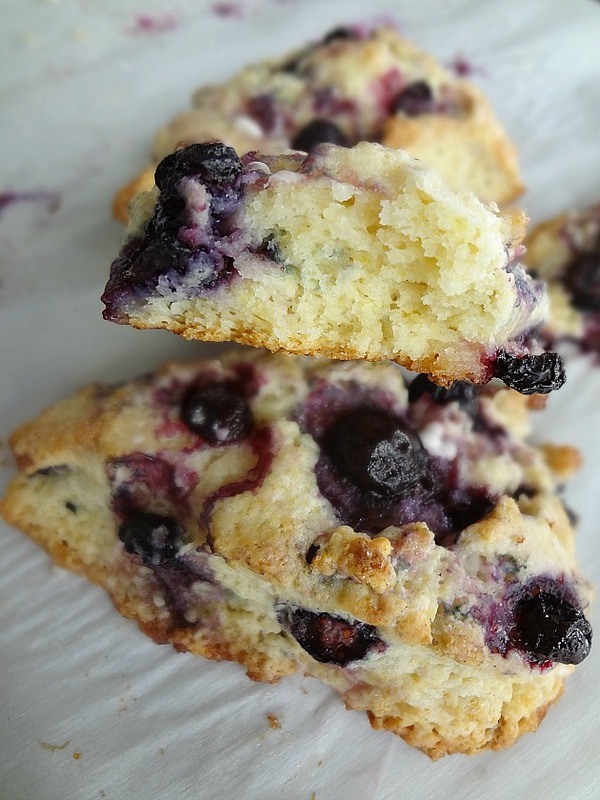 When we made our move, Michael's mom brought some lemon blueberry scones to snack on. Nobody ate them sooo we had leftovers and Michael had them for breakfast on weekday mornings. After they were gone, he requested I make him a homemade version. And it had been SO LONG since I'd last made scones-so of course I agreed! One thing that was a must was that these scones MUST not be super dry. Michael likes a moist (ew I knew everyone hates that word) scone. And this recipe definitely fit that bill! They have a beautiful crumble but aren't all dry and...well...crumbly. The glaze also helps add extra insurance against over-dryness. So yeah...pretty petty scones with a zesty sweet lemon glaze. The perfect thing to serve for brunch or breakfast or to gift to people you like! Or love...like your hubby. As was my situation...and it was less of a gift and more of a fulfilled request...but...you get the idea. And guys...IT'S ALMOST CHRISTMAS. And I hear that Santa thinks these scones hit the spot after a night of delivering presents. So...yeah. Maybe be cool like Santa and eat scones Christmas morning. Preheat oven to 400F degrees. Move baking rack to the middle-low position. Line a large baking sheet with parchment paper or a silicone baking mat. In a large bowl, whisk together the flour, sugar, baking powder, salt, and lemon zest. Grate the frozen butter (I use the largest holes on a box grater but a food processor could work as well) and combine with the flour mixture until it resembles a course meal. In a small bowl or measuring cup whisk together the heavy cream, egg, and vanilla extract. Drizzle over the dry ingredients and gently combine until everything is evenly moistened (it will be a little wet). 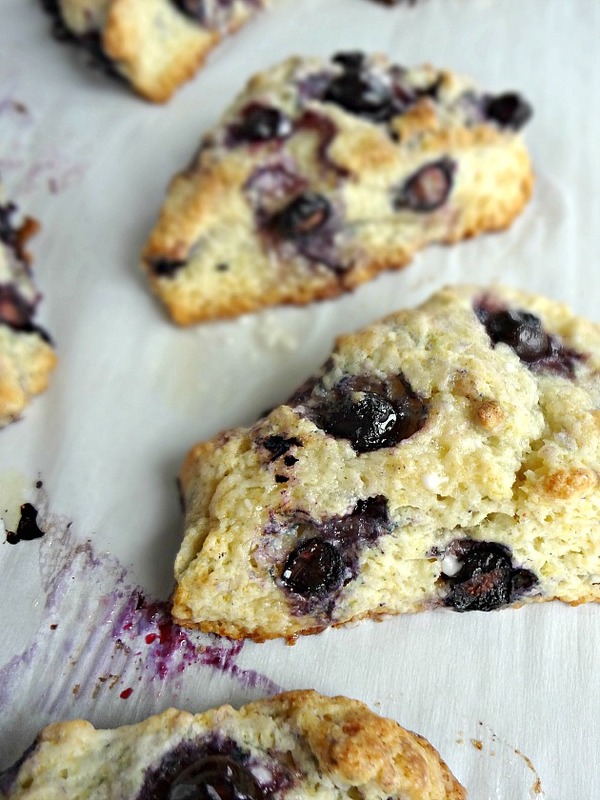 Gently fold in the blueberries-do not overwork the dough! Work the dough into a ball with floured hands to the best of your abilities and transfer to a floured surface. Press into an eight inch disc and cut into 8 equal wedges with a very sharp knife. 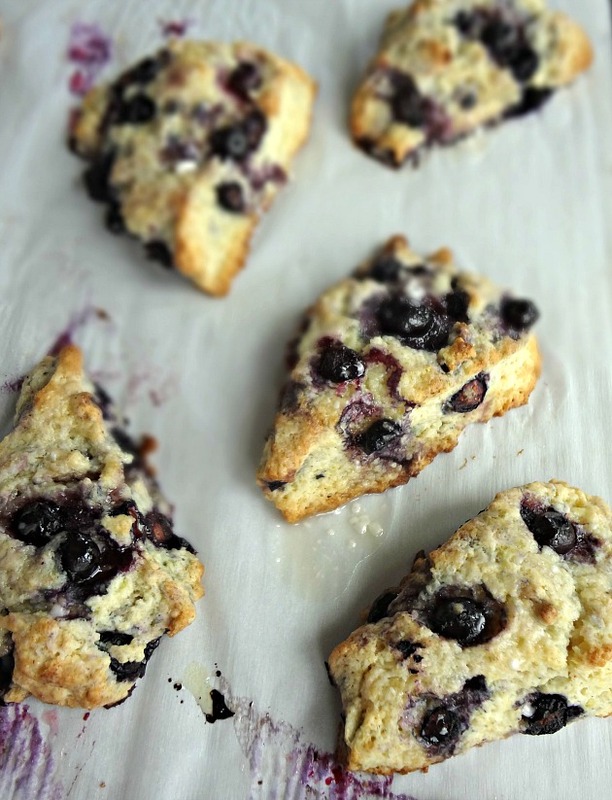 Place scones at least 2 inches apart on the prepared baking sheet. Bake for 20-25 minutes, until golden around the edges. Let cool for a few minutes. Whisk powdered sugar and 2 tbsp. lemon juice together for the glaze (if too thick add an additional tbsp. of lemon juice). 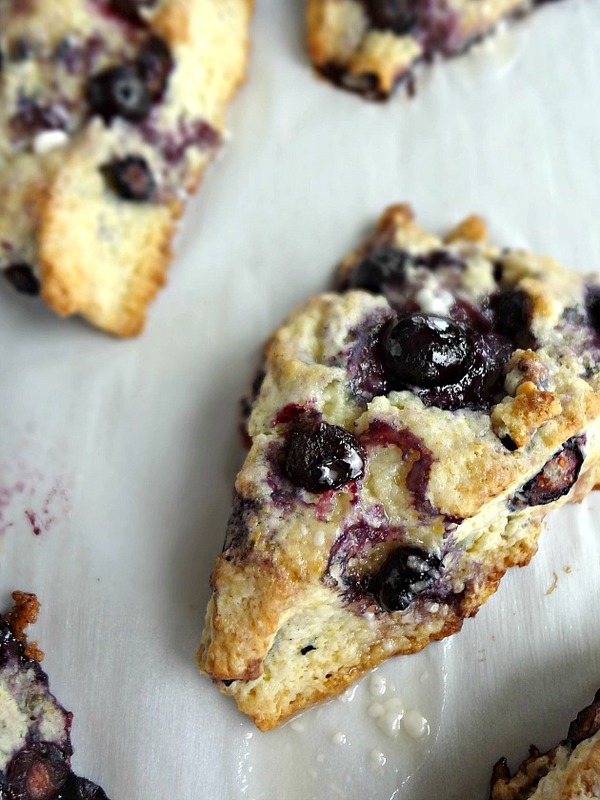 Right before serving, drizzle scones with the glaze. Best enjoyed fresh! Store leftovers in an airtight container at room temperature for up to 2 days or freezer for up to 3 months.